If someone pulled up to your house and started petting your dog, you’d probably be weirded out and maybe even call the cops. Understandable, but Laurel Palmero who grew up in Minnesota and runs North Shore Horse Rescue with husband Tommy Renzetti has more of a Midwestern approach. Passerbys are welcome to pop in and visit with the rescued horses. Bonus points if they have carrots in hand. For many of the children it’s their first time meeting a horse and like a quintessentially curious kid, they aren’t afraid to ask questions. “They want to know the stories. They want to know what happened to this one, or that one. “Why is that one limping?’” Palmero said. The parents are often just as surprised to hear about horse abuse and neglect. The public tends to be aware of the issues facing millions of homeless dogs and cats, thanks in part to the heart-wrenching ASPCA commercials you can’t bear to watch and grassroots efforts from local shelters. They’re less likely to know more than 150,000 American horses, some of which were once loved by an owner who could no longer care for them and sent to an auction house, are shipped over our boarders each year to be slaughtered for human consumption, according to the ASPCA. 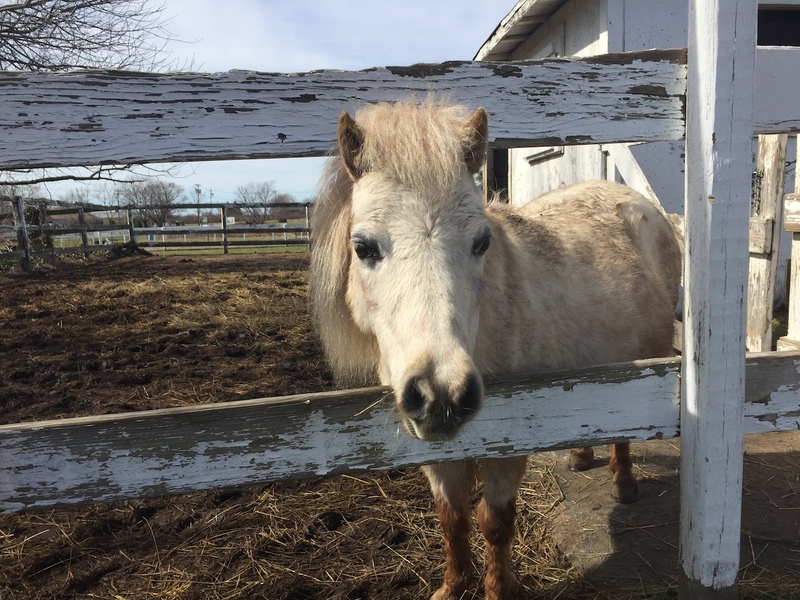 It’s why, in addition to the open-door policy, North Shore Animal Rescue visits local high schools, hosts community groups like the Girl Scouts and on April 23 at 10am will host Help a Horse Day on their property. They want everyone to know that, just like your beloved shelter pup and kitty, horses need to be loved, wanted and protected. 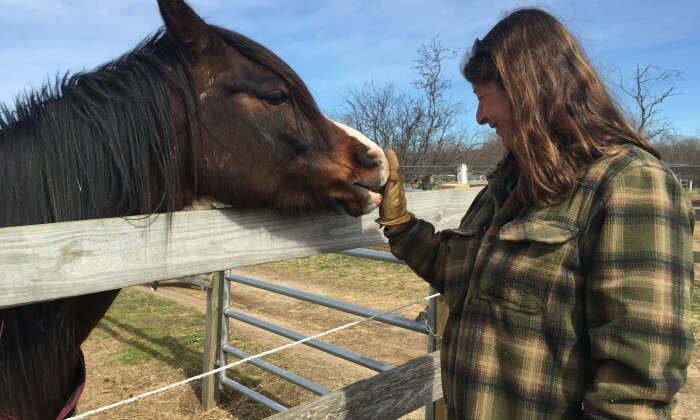 North Shore Horse Rescue encourages people to take “I Love Lucy” photos with Lucy, who came to the rescue after her owner in Southold could no longer care for her. “That horse knew that family. It wants to know, ‘Where’s my family and why am I being treated that way?’” Palmero said. Palmero never had a problem understanding horses were family. She had them growing up in Minnesota, and horse statutes decorated her room. After job-hopping in her 20s, she and Renzetti got their first horse together when Palmero was in her early 30s. “Once you’re in it and you’re involved in it even as a child you never really get it out of your system, even if you take a break,” she laughed. In 2002 when her sister lost her job in New York City after 9-11 and could no longer care for her four horses, Palmero and Renzetti rented the space at 2330 Sound Ave. as a boarding facility. A year later, someone came to her with Phoenix, a mustang that needed to be re-homed. They took Phoenix and learned about the issues with mustang round ups out West, where wild horses are removed from land and put in facilities or killed because farmers need the land for livestock. That led them to learn more about equine abuse, neglect and slaughter and soon the boarding facility became a sanctuary as well. Over the years, Palmero and Renzetti have rescued 35 horses, mostly from starvation and neglect. They get calls about potential cases, but cannot trespass and take the horse, so it tends to be up to the owner to realize they can no longer care for the horse. Sometimes horses are made available for adoption. The standards are high. 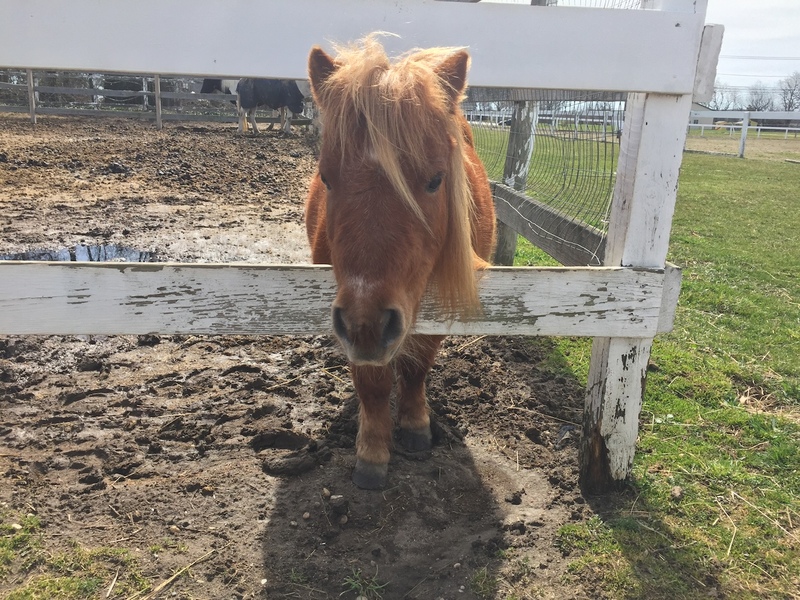 North Shore Animal Rescue must see the farm or backyard where the horse will leave, people must lease and care for the horse at the rescue for a month and there must be a clear bond. “We’ve already rescued them from a bad situation, so we do not want to put them back in a bad situation and we don’t want the horse to come back,” Palmero explained. Usually, the horses remain in the sanctuary. Of the 17 horses currently at the rescue, only three are adoptable. Sam, who came to the rescue when his owner in Southold could no longer care for him, loves to pull around little kids in a cart as part of fall fun on the North Fork. But the horses aren’t bottom of the barrel to the little kids who come visit and get pulled around in a cart by Sam the pony who is thrilled to oblige or the many volunteers who come groom, bathe and feed horses as an escape from every day life. “They’re like rockstars,” Renzetti beamed. “These people, they need an outlet, and that’s what this is for them. It’s a sanctuary for people as well,” Palmero added. And they’re certainly not bottom of the barrel for Palmero. “I always wanted to be a veterinarian and this is probably the closet that I’ll get…the fact that I didn’t get to go to college but I get to learn so much hands on, that’s the cool thing,” she said.